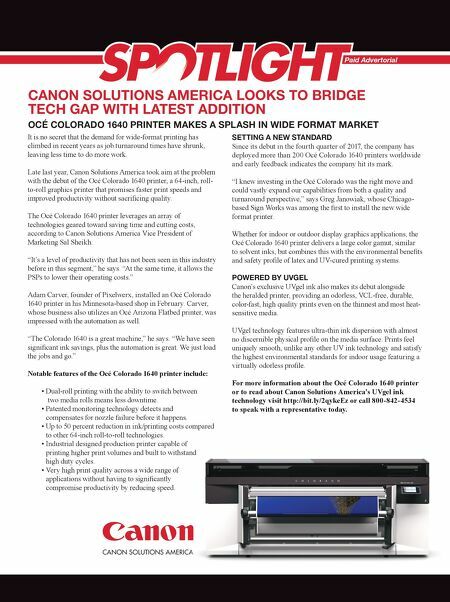 OCÉ COLORADO 1640 PRINTER MAKES A SPLASH IN WIDE FORMAT MARKET Paid Advertorial CANON SOLUTIONS AMERICA LOOKS TO BRIDGE TECH GAP WITH LATEST ADDITION It is no secret that the demand for wide-format printing has climbed in recent years as job turnaround times have shrunk, leaving less time to do more work. Late last year, Canon Solutions America took aim at the problem with the debut of the Océ Colorado 1640 printer, a 64-inch, roll- to-roll graphics printer that promises faster print speeds and improved productivity without sacrificing quality. The Océ Colorado 1640 printer leverages an array of technologies geared toward saving time and cutting costs, according to Canon Solutions America Vice President of Marketing Sal Sheikh. "It's a level of productivity that has not been seen in this industry before in this segment," he says. "At the same time, it allows the PSPs to lower their operating costs." Adam Carver, founder of Pixelwerx, installed an Océ Colorado 1640 printer in his Minnesota-based shop in February. Carver, whose business also utilizes an Océ Arizona Flatbed printer, was impressed with the automation as well. "The Colorado 1640 is a great machine," he says. "We have seen significant ink savings, plus the automation is great. We just load the jobs and go." Notable features of the Océ Colorado 1640 printer include: • Dual-roll printing with the ability to switch between two media rolls means less downtime. • Patented monitoring technology detects and compensates for nozzle failure before it happens. • Up to 50 percent reduction in ink/printing costs compared to other 64-inch roll-to-roll technologies. • Industrial designed production printer capable of printing higher print volumes and built to withstand high duty cycles. • Very high print quality across a wide range of applications without having to significantly compromise productivity by reducing speed. SETTING A NEW STANDARD Since its debut in the fourth quarter of 2017, the company has deployed more than 200 Océ Colorado 1640 printers worldwide and early feedback indicates the company hit its mark. "I knew investing in the Océ Colorado was the right move and could vastly expand our capabilities from both a quality and turnaround perspective," says Greg Janowiak, whose Chicago- based Sign Works was among the first to install the new wide format printer. Whether for indoor or outdoor display graphics applications, the Océ Colorado 1640 printer delivers a large color gamut, similar to solvent inks, but combines this with the environmental benefits and safety profile of latex and UV-cured printing systems. POWERED BY UVGEL Canon's exclusive UVgel ink also makes its debut alongside the heralded printer, providing an odorless, VCL-free, durable, color-fast, high quality prints even on the thinnest and most heat- sensitive media. UVgel technology features ultra-thin ink dispersion with almost no discernible physical profile on the media surface. 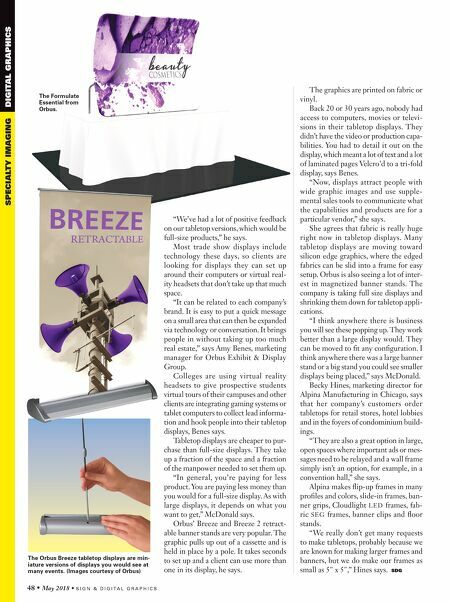 Prints feel uniquely smooth, unlike any other UV ink technology and satisfy the highest environmental standards for indoor usage featuring a virtually odorless profile. For more information about the Océ Colorado 1640 printer or to read about Canon Solutions America's UVgel ink technology visit http://bit.ly/2qykeEz or call 800-842-4534 to speak with a representative today.